Lawrence of Berkley and I took a trip up the coast from Marysville through the Blue Water Bridge chasing the American Integrity. 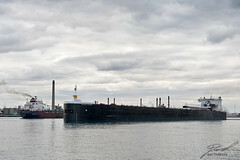 When we arrived at Desmond Landing we had a south bound freighter. The two met around the old ferry dock.